Yesterday I went on a little shopping spree for some more household items and some accessories for the 20's themed party I was going to attend later on at night. I was looking for a bedazzled headband or a hair pin, anything that looked remotely like the 20's as I hadn't brought any appropriate dresses with me. My first stop was Primark, which isn't my usual destination for shopping but it has really good bathroom mats. I wasn't thinking about buying anything else from there but when I reached the queue I saw this pin and I knew I had to have it. At first I thought it would be too big but it turned out just perfect! 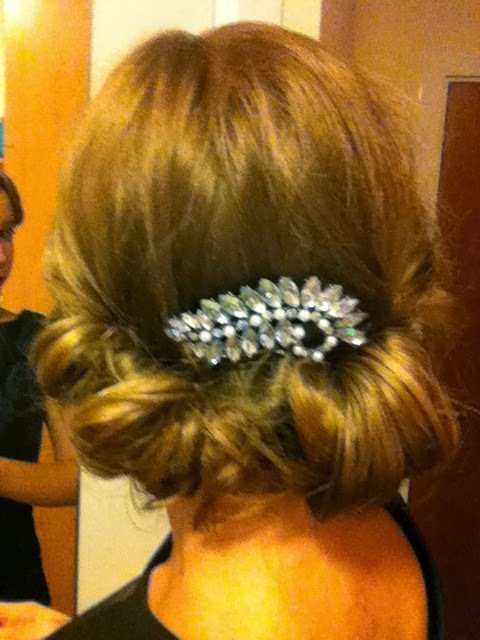 I don't even know how I managed to do my hair like that, it's a personal success and I'm really excited by it. I love dressing up and I love the 20's so this was quite the occasion for me. If you want to check out the make up I wore check my instagram account @mariadinca !